During World War II, over 110,000 Japanese Americans—two-thirds of them U.S. citizens—were forcibly removed from their West Coast homes and detained in inland concentration camps, one of which was the Heart Mountain War Relocation Center in Wyoming. After the draft was reinstated for Japanese Americans, 3500 Nisei (children born in the United States to Japanese-born parents) were drafted in the first year, and many were assigned to the segregated 442nd Regimental Combat Team. Some at Heart Mountain refused to report for their pre-induction physical examinations to protest what they believed to be the denial of their rights as citizens. This refusal led to the arrest and trial of 63 young men for draft evasion as well as a trial of eight others for conspiracy to aid and abet the draft resisters. On April 6 Fordham’s Asian Pacific American Law Students Association presented a program, “Heart Mountain: Conscience, Loyalty, and the Constitution,” to remember and learn from these trials. With Hon. 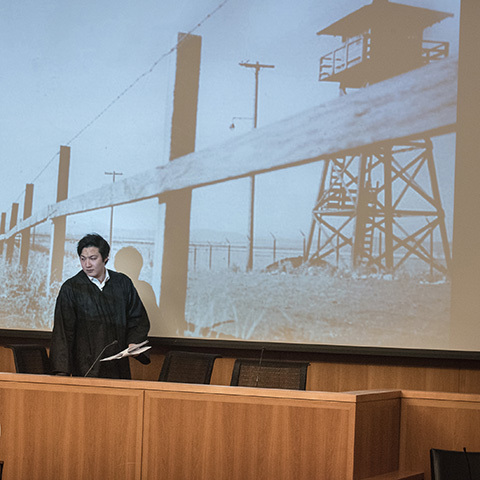 Denny Chin ’78 and Professor Thomas H. Lee, APALSA reenacted two court cases that arose when the U.S. Armed Forces drafted Nisei from within the Heart Mountain camp. The script for the event was based on the actual trial transcript and written by the Asian American Bar Association of New York, principally by Judge Chin and his wife, Kathy Hirata Chin. This marks the ninth program that they have written with the AABANY. In US v. Fujii (known as the Mass Trial) 63 Nisei detainees were placed on trial for failure to comply with the Selective Service Act. Stripped of their natural-born rights as American citizens within the camps, these Nisei had banded together to form the Heart Mountain Fair Play Committee, collectively resisting their conscription into a segregated Army unit until their civil rights were restored. After six days of trial, all 63 men were indicted on draft evasion charges and sentenced to federal prison. It did not; seven leaders of the FPC, including Emi, were indicted and sentenced to serve two- to four-year prisons sentences. Heart Mountain closed in November 10, 1945, but most of the convicted continued to serve out their sentences into 1946. On Christmas Eve 1947, President Harry Truman pardoned the resisters. While Service members of the 442nd combat unit were welcomed home as heroes, the resisters were regarded as traitors and cowards within the Japanese-American community. It was only years later that the resisters were finally recognized for their courage and conviction in standing up to the government to oppose the violation of their rights. In addition to co-writing the script, Judge Chin participated in Wednesday’s reenactments and provided overall narration during the program. The reenactments were followed by a Q&A and a small concert featuring traditional koto player Kento Iwasaki and soprano Joy Tamayo. 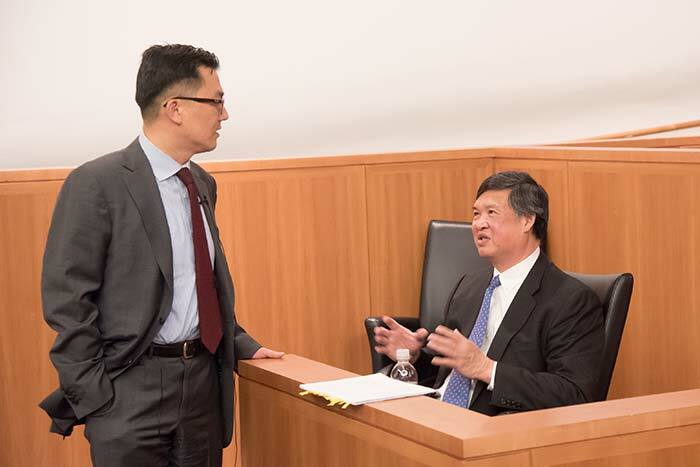 Questions concerning race, inequality, and the law underscored a statement from Judge Chin regarding the relevancy of the proceedings. “Racially motivated policies and discriminatory practices are timely issues,” he said.